There is a new comming up dessert bar in Ekamai, the “Shugaa”. The Shugaa is the french style of delicate dessert by Thai chef who made the creative menu and plated dessert that aways surprise and amaze the customers. 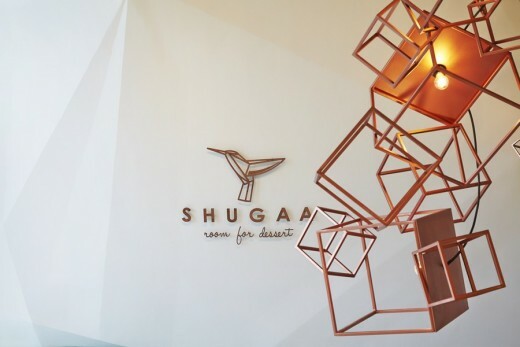 These dessert menu become the inspiration of the Shugaa room interior design which can be noticed from the sugar element everywhere in this dessert bar. 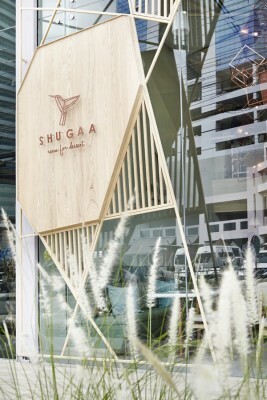 The concept of the interior design of Shugaa had been researched from the base of sugar which its form is sugar molegules and crystals. 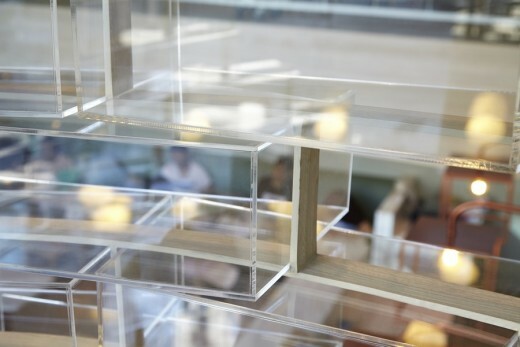 Seeing from the outside through the glass wall, there is polygon installation hanging around the front that is inspired from sugar crystals. 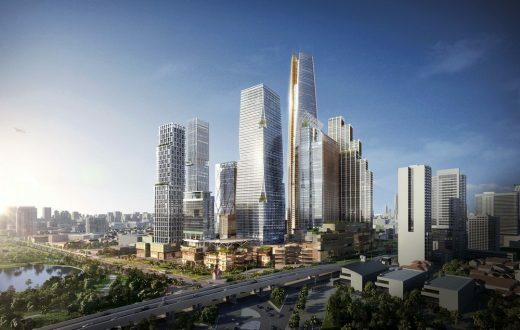 Besides, wood material also had been used in the design together with mint green colour to make it feel warm and earthy. 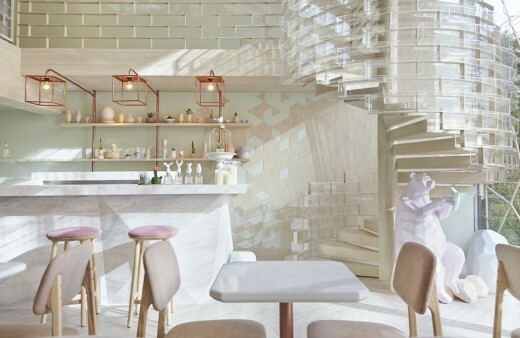 Designer team have added a dash of modern and luxurary by using rose gold colour element and marble counter bar. 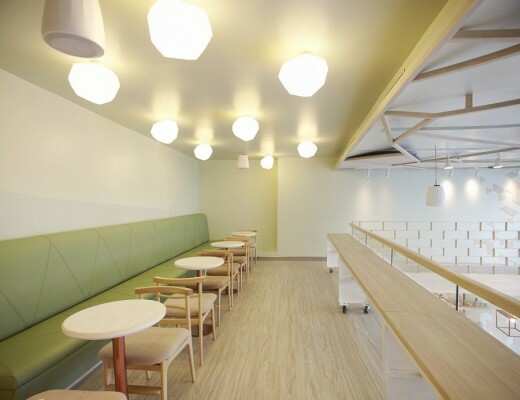 The first zone of the dessert room is for customer sitting and enjoy their dessert. 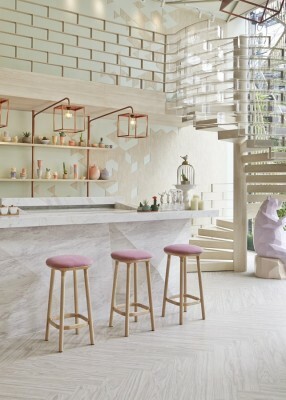 When customer sitting at the bar they will see the polygon shaped wall which is made from the special building technique and cause the interesting dimension to the room. They also adding the rose gold lighting installation hanging along the ceiling wall. 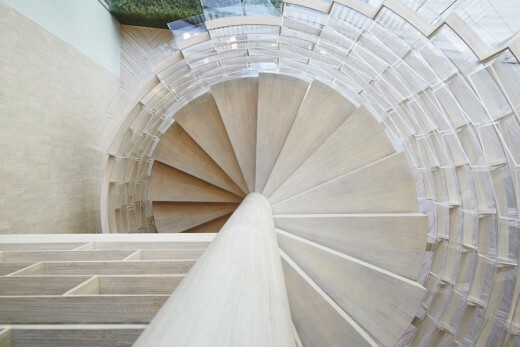 Then they connect the first zone to the next zone upstairs by using spiral staircase. This staircase is the highlight of the dessert room. 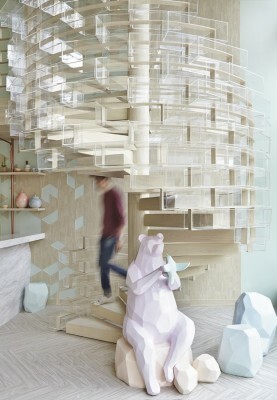 They use the magic of design to invent the sugar crystal staircase by using creative technique of arranging acrylic box along the spiral staircase which is the iconic of the Shugaa dessert bar. When customers walk to the second floor, they will be amazed with view of dessert preparation from the chef. Step further to the final zone, there is the private area that is ideal and quite place for having dessert while reading and working. 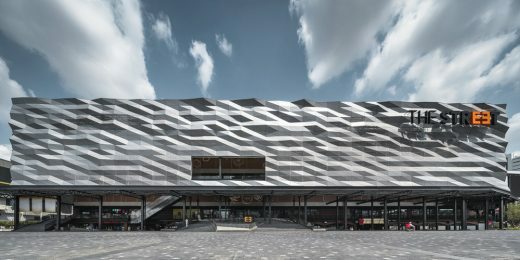 Besides, it can be rearranged for to be workshop area that is open for dessert and fondant workshop which is the learning community for those whom have the same passion in sweet and Shugaa.